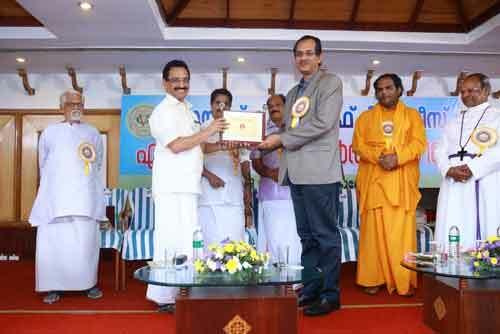 Dr. R. Padmakumar’s achievements and honors pile up by the day. For a man who has done over 15000 laparoscopic surgeries till date, he is forever on the move and most of his halts are in the operation theaters around the world. In many countries Padmakumar has made his presence inevitable for his astute skill involved in complicated surgical procedures. He is well known in the international medical groups as one among the few surgeons adept at performing endoscopic thyroidectomy, thoracoscopy and bariatric surgery. After securing a medical seat in Allaphuzha Medical College in 1986, Padmakumar moved to Delhi to pursue his post graduation at AIIMS and Moochand Hospital. It was in 1993 when laparoscopy had just been introduced in India. So by the end of his post graduation, he was exposed to the procedures of laparoscopy. The excellent training provided propelled Padmakumar to pursue it seriously. After post graduation, in 1997, he worked with Dr. Balakrishnan at Mavellikara where he began his laparoscopic procedures. “When I got exposed to laparoscopic surgery during my post graduation, I was foreseeing the possibilities and breakthrough this could create with the advent of science and technology. Though I kept doing surgery, I ensured that I keep upgrading myself with all the developments and focused entirely on sharpening my skills”, begins Dr Padmakumar who is an International Consulting Surgeon for Dubai Government Hospital for endoscopic thyroid and parathyroid surgery, a rare honor for an Indian Surgeon. Surgeons learn many of the latest techniques by observation rather than formal classes. Surgeons record video of processes of certain surgeries and these are shared with their peers. Notes are exchanged for various surgeries and better procedures are always inculcated. Dr Padmakumar kept his eyes and ears open and with curiosity he got many insights on doing procedures with minimal invasion. Open procedures that were done in the abdomen were replaced with keyhole surgery. Keyhole surgeries need good skills and Padmakumar says as a surgeon, hooing skills was very important. In spite of having done three years of laparoscopic surgery and assisting world renowned surgeons, Padmakumar has spent too many hours on the trainer units (mock surgery unit without patients) before starting by himself. “These surgeries require extreme precision because the surgeon needs to do it watching a screen, though it gives a twenty times magnified view of the surgery area. Along with it, I ensured that I attend all the conferences in the field from where I get many tips and an upper hand in surgeries,” elaborates Dr Padmakumar, who has conducted over 7000 laparoscopic hernia surgeries. He underwent two specialized training in cancer surgeries at Apollo Hospital and at Tata Hospital, Mumbai. He was selected to work at Caritas Hospital for four years where his experience in laparoscopic surgery came in as an advantage. From there, he moved to Sunrise Hospital, Kochi, from where he delved into Obesity Surgeries and that is where the turning point in his career happened and he acknowledge the encouragement from Dr Hafeez Rahman. Padmakumar noted that the Obesity Surgery was effective in controlling Diabetes and he was one among the first five in the world to do Diabetic resolution surgery. Dr Aureo de Paula from Brazil devised a technique called Ileal Interposition. It was a difficult operation to mimic. After watching the surgery in Hyderabad, Padmakumar modified and simplified the technique. This method got him worldwide attention and he was invited to present papers at the International Conference of metabolic surgeons in Canada and Vienna to elaborate on this new Hybrid Technique which Padmakumar and his team had invented and was published in the reputed International Journal of Surgical Innovation. 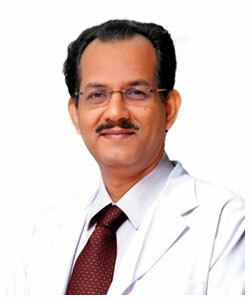 Dr Padmakumar is a sought after surgeon to conduct these surgeries in various parts of India. In the Gulf, Diabetes and Obesity were taking away 40% of the health expenses and he was invited by renowned hospitals in the Gulf to conduct these procedures. He has helped citizens from many countries in resolving diabetes and obesity and lead a healthy life. In recognition of his work, Dr Padmakumar was selected in the list of “100 most powerful Indians in the Gulf,” holding 28th position for the professional excellence and commitment in obesity and diabetes surgery. His surgery precision and professionalism came to be known across the world when he and his team operated on a 39-year-old patient who came with severe bowel bleeding. This patient was rejected by major hospitals because the patient’s religious belief didn’t allow him to have the blood transfusion. Dr Padmakumar took up the risk and operated on him. This surgery is recorded as one of the most referred case in medical history that took up a patient with a hemoglobin of 2 g/dl for anesthesia and major bowel surgery without transfusing blood or blood products prior to, during or after surgery and saving the life without complications. He also has the World record of performing Endoscopic Branchial cyst removal in the youngest age ever reported (3-year-old girl). Dr Padmakumar also successfully conducted endoscopic thyroidectomy and one of the first ones to do so. These procedures do not have any marks of surgery on the neck and gives confidence to the patient. He also trained his peers and colleagues in many of these highly complicated surgeries. 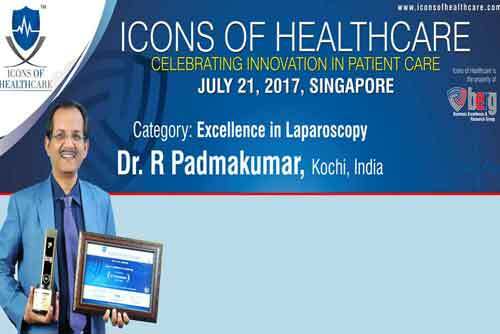 Dr Padmakumar’s articles and innovative techniques got published in International Journals, the lectures and workshops at various International conferences, his large patient group across 28 countries and surgical education programs were recognized by the Royal College of Surgeons. Glasgow which conferred him a Fellowship (FRCS) for his substantial contribution to the specialty. Dubai Government run hospital has over 25 skilled surgeons. Yet, Dr Padmakumar’s expertise is sought by the country regularly to conduct endoscopic surgery for tumors in thyroid and parathyroid gland. He provides his expertise in VPS Lakeshore Hospital, KIMS Hospital and Renai Medicity, Kochi, and VSM Hospital, Mavelikkara in Kerala and VPS Medeor Hospital, Dubai and Star Care Hospital, Muscat. “Teamwork has been crucial to my success as an expert endoscopic surgeon and I really give my credit to my team in my success so far. I am highly indebted especially to Dr Madhukara Pai, Dr Farish and Ms Premna who has helped me tremendously in my professional growth,” concludes Dr Padmakumar. With more power comes more responsibility and through various societies and organizations, Padmakumar is spreading the knowledge to his juniors with an aim to bring comfort to patients. He had conducted various National and International Conferences in Surgical Laparoscopy. The training programs are coordinated by Verwandeln Institute, Kochi. All these endeavors were very actively supported by Prof. Dr. M. C. Misra the Director fo AIIMS, New Delhi. 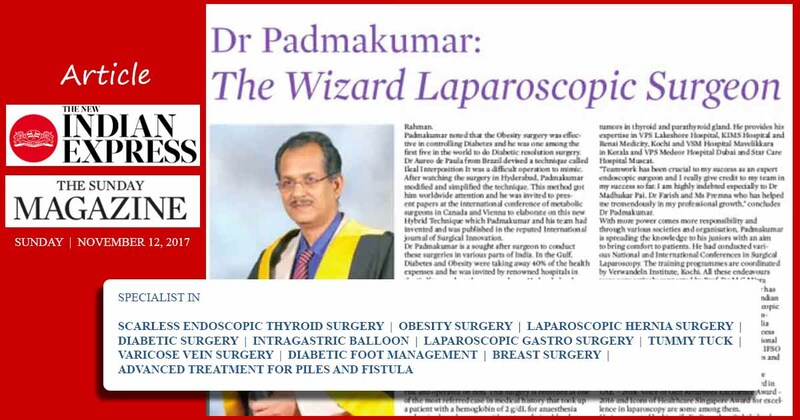 Dr Padmakumar has donned many caps such as National President of Indian Hernia Society, Vice President of Society of Endoscopic and Laparoscopic Surgeons of India, Founder Member – Obesity and Metabolic Surgery Society of India and Founder Member – Association of Minimal Access Surgeons of India. Outside India, he is an International Faculty of IASGO on Hernia and Diabetic Surgery. IFSO on Diabetic Surgery and Associate Editor: Diabetes and Obesity International Journal. For all his achievements awards and accolades have followed Padmakumar. The Global Achievers Award in UAE – 2014. Voice of Gulf Returnees Excellence Award – 2016 and icons of Helathcare Singapore Award for excellence in laparoscopy are some among them. He is supported by his wife, Dr Deepthy, Ophthalmologist, daughter Divya pursuing a degree in Psychology and mother Mrs Padminiamma. After the conversation, Dr Padmakumar left hurriedly for a surgery fixed for a patient suffering from Cancer. He reminded me that in case if he doesn’t pick up his call, it essentially means that he is in the operation theater.